Um, am I suppose to be making girly cards?NO! I should be making teachers gifts. Did I make a single thing for them today? NOPE! And tomorrow is the LAST DAY! But after a nasty thread on SCS I felt compelled to just stamp the day away CAREFREE!!!!!!!! Im not too worried cause Alexa is going to summer school so I can send the stuff in late! Right? WoW I sound selfish and terrible dont I? You know what though, Ive said it before and I will again (especially after bridal shower from HELL week) sometimes we need to be selfish and have MY time! My emotions have been so up & down these days that I think I really needed this. So here is what I did (or a portion of it anyway) with MYTIME. I cannot remember who makes that delicious paper. Im too tired to go look. SO if you REALLY need to know-email me. 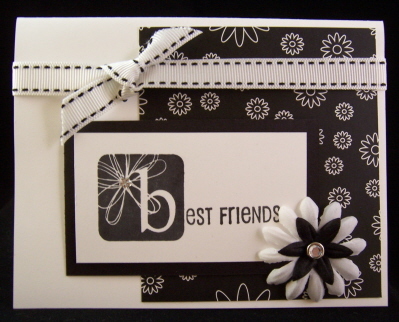 All stamps are by Lizzie Anne Designs. 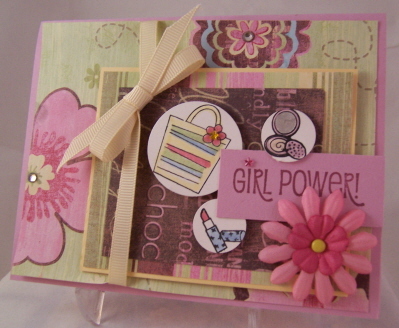 The top card uses Girl Power (also sold at All That Scraps now too!) As does the card below. The “b” block is from the Happy Birthday set. Here is one more I did. I told you Ive been getting easily sidetracked! Its wicked simple but I LOVE it! Something about B&W that I just go nuts for! Paper is by Imaginesce. Not complete without the bling! Again nothing fabulous to report. I had NO thoughts, just stamp stamp stamp. So thats what I did. God help me! Summer vacation begins Thursday! EEEK! 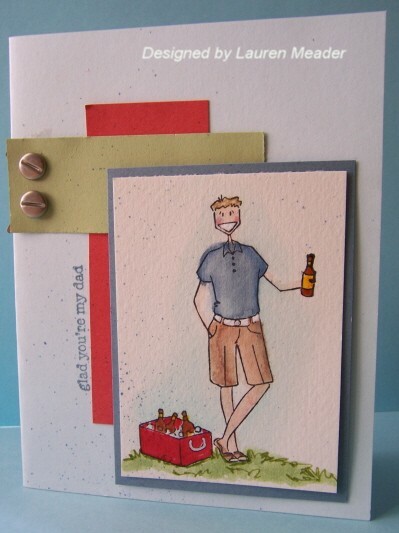 Well here it is – Jason’s Father’s Day card. It is by no means the FABULOUS creation I thought I’d make. Instead I go sidetracked again, and started my uploads for the Dirty Dozen gallery! Cant share those but just thought Id share where my head is at. Im quite excited by what I have so far. Anyway, my friend Nicole sent me this supah cute image of BeerFella. Thanks girl you saved my hiney!!!! I colored him to look like Jason. My hubby is definitely hotter-but I think this guy fits the bill. Nothing fabulous to say about him. Him being the card! Jason is an AMAZING parent. I wish I were as good as he is. My children are very lucky to have a dad like him. What I wouldn’t have given for what they have growing up. Now I just have to sign the thing. All the cardstock is by Martha Stewart.